Dana has always been an animal lover. 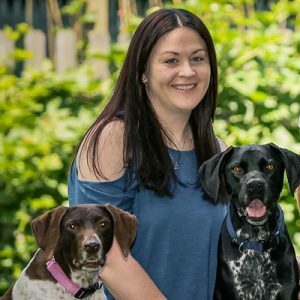 While growing up in Somerset county, Dana first fell in love with German Shorthaired Pointers the moment she met her first dog, Courtland. Since then, she has been enamored with the breed, always having one as part of her family. Dana has been an active member of the German Shorthaired Pointer Rescue of New Jersey since 2008. She has fostered over 15 dogs until they found their forever homes and has helped place and transport many others. Dana graduated from Delaware Valley University in 2008 with a Bachelor of Science in Animal Behavior. She was a dog trainer and managed two large doggy daycare facilities for several years. Dana is a true world traveler and has traveled across the equator to the Galapagos. She has been to Jamaica and has been on safari to Tanzania twice. She has plans to see more of the world with her husband Douglas who she married in 2017. Dana has a large pack of her own including 2 GSPs, a Portuguese Pointer mix, a Rottweiler, and a Bloodhound. In her spare time, Dana enjoys painting, football, spending time with family, and has a love for movies.